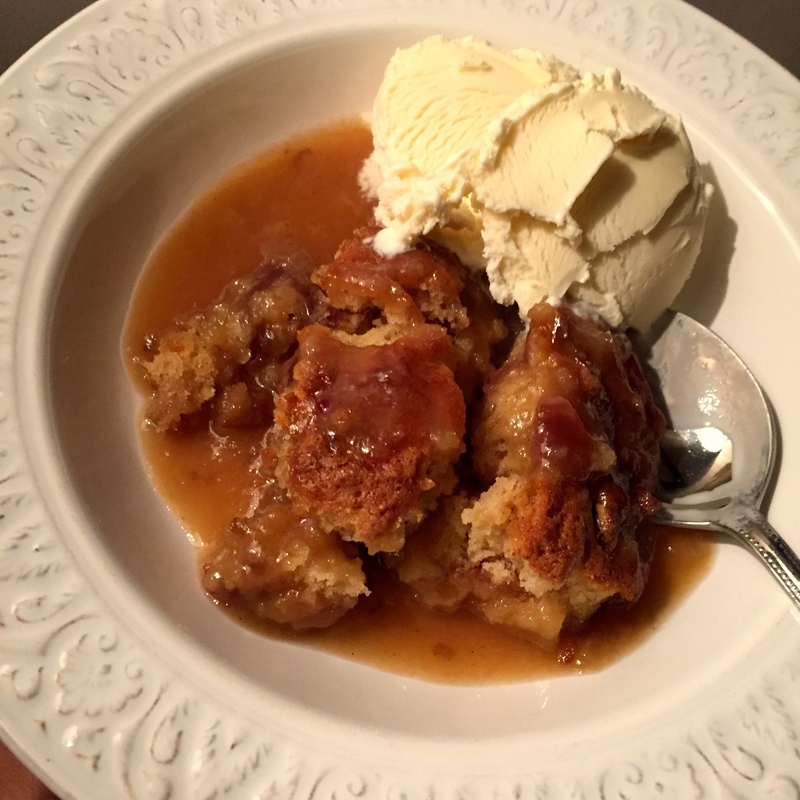 A very quick and easy take on sticky date pudding for a cold winters night! My go to make at home version. I must say this does not taste as great as the ones I love eating in Aussie cafes back in Sydney, but is a pretty good second option if you are not down under and are feeling nostalgic and really need to have some! Very quick to throw together and very convenient cause its like a self saucing pudding. After you have put the cake mix in the dish, you sprinkle it with some dark brown sugar, butter and 2 cups of boiling water, it looks like a nasty mess, but after you bake it in the oven the sugar and water turns into a pretty nice toffee sauce which somehow sinks to the bottom and the pudding gloriously rises to the top. This is another quick and easy Nigella recipe. I am making more and more of her desserts and really loving them! You may have noticed that the color of this sticky date pudding is not as dark as you would expect it to be, the reason is that I did not have muscovado sugar at home and rather than venture out in the -22C weather I just used normal light brown sugar, the toffee flavor is definitely also more developed when you use the dark muscovado sugar. Preheat the oven to 190°C/gas mark 5/375ºF and butter a 1½ litre / 6 cups capacity pudding dish. Combine the 100g / ½ cup of dark muscovado sugar with the flour in a large bowl. Pour the milk into a measuring jug, beat in the egg, vanilla and melted butter and then pour this mixture over the sugar and flour, stirring – just with a wooden spoon – to combine. Fold in the dates then scrape into the prepared pudding dish. Don’t worry if it doesn’t look very full: it will do by the time it cooks. Sprinkle over the 200g / 1 cup of dark muscovado sugar and dot with the butter. Pour over the boiling water (yes really!) and transfer to the oven. Set the timer for 45 minutes, though you might find the pudding needs 5 or 10 minutes more. The top of the pudding should be springy and spongy when it’s cooked; underneath, the butter, dark muscovado sugar and boiling water will have turned into a rich, sticky sauce. Serve with vanilla ice cream, creme fraiche, double or single cream as you wish.